Prize Value Total: $102.89 How would you like to win this awesome Grilling Prize Package for that special Dad in your life?? If you answered YES you would then just fill out the simple form below. Good Luck! !This Giveaway is Open to the US ONLY!! The Kansas City Strip Steaks of course! LOL! 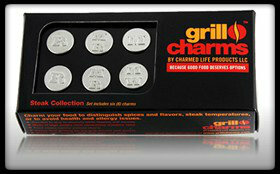 I like the grill charms as #1 choice, the steaks as #2 choice and the bbq set as #3 choice. Great giveaway, thanks for the chance to win! I would love the Steaks! My dad is in Al, and I would love to send him a Steak dinner! Bbq tool set because we just got a new grill. I would be very excited about the grill set if I won. Thanks. I'd have to say the 18 piece bbq set.I'd like to give it to my brother-in-law since he bar-b-ques all the time.His are getting old and worn. All the gifts are nice.I could split them up between my dad and brother-in-law. Thanks for the giveaway and the chance to win! BBQ set...actually all of them...yum. 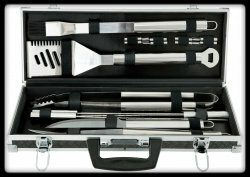 The bbq tool set look amazing and the steaks! Most excited about the bbq tool set because we don't have any, but need some. I'd love to win the BBQ set. I'm most excited about the steaks because they look yummy and it's grilling season! I'm excited about steaks...do you know how expensive they are? This would be awesome. The steaks because they look delicious! I think the steaks would be the best prize. Thanks for the giveaway! I like the steaks the best. The Kansas City Steaks! Yum! Super excited about the steaks. We love a great steak on the grill every now and then. Most excited about the steaks!! OMGosh.. the steaks would be AWESOME! Thank you! I'm excited about the grilling set, it would really come in handy at my house. The grilling tool kit! My hubby would freak if I won that! He loves to grill! Mr. barbq set! My husband would love the grilling set! i am most excited about the bbq grill set! my husband would love it! I am most excited about the Kansas City Steak Company steaks! the steaks! love me some steak! The steaks and the grill set! The Kansas City Steak Company pack! I'm excited about the grill charms. We all like our meat cooked differently. the grill set would go great with the grill that i won at work years ago! Personally I like the grill charms. My hubby would be most excited about the steaks. lol. he's such a man. My favorite would be the Steaks! 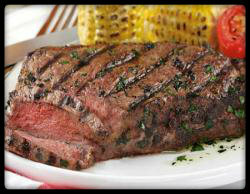 I am most excited about the steaks... because I know my husband, and I know he salivates at the mere mention of beef. 18 piece Grilling Set because my husband loves cooking we cook out atleast twice a week. im most excited about the 18 piece Grilling Set! I am most excited about the strip steaks because I love to eat meat! The grill set! We really need one.